This tapestry is one of a set of eight tapestries that depict the stories of Queen Artemisia. These tapestries were modeled after Catherine de’Medici, who ruled France during the mid 16th century. During her rule, France was embroiled in religious and economic turmoil. In an effort to demonstrate her own devotion to her husband and her ability to rule successfully, Catherine de’Medici adopted Queen Artemisia as her alter-ego, and in the late 16th century a set of tapestries were made to illustrate the story. 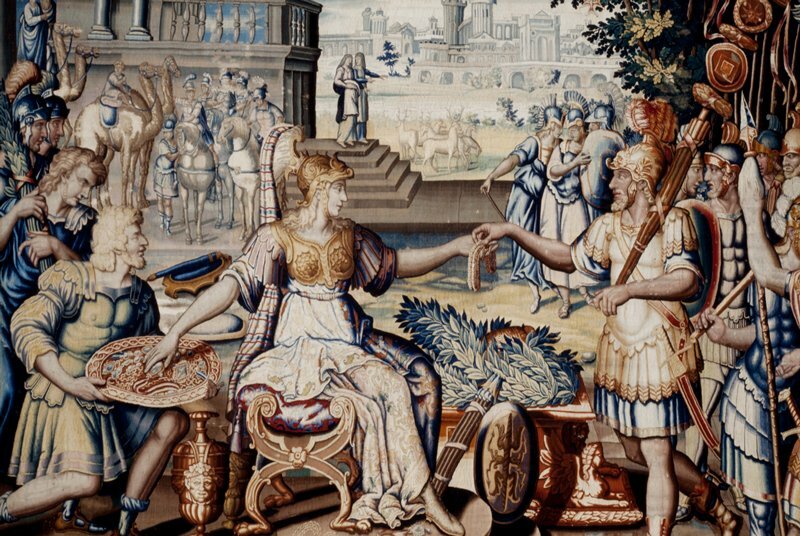 This tapestry depicts the victorious queen, Artemisia, paying her royal forces with jewels and gold plate after the battle of Rhodes. As in several of the other tapestries from this series, the coats of arms in France (lilies) and Navarre (crossed chains) have been included in the borders, as well as the initial 'L' of Louis XIII. Other tapestries from this set are on view in Gallery 235.